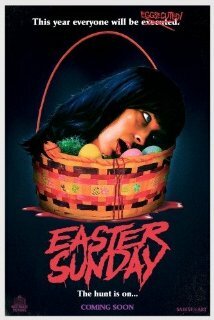 There isn't many holidays left for the slasher genre to infiltrate but 'EASTER SUNDAY' has found one and slashes it up. Starring the late Robert Z'dar (Maniac Cop) as Sheriff Arkin who 24 years previously had killed the serial killer Douglas Fisher on Easter night, has to once again contend with him due to some partying friends who bring him back from the dead ruining everyones night. This 1980's homage movie has alot going for it, wisecrack one-liner killer, over the top acting, some great special effects and even a cameo from the first Jason Voorhees himself Ari Lehman as a postman. One thing that really stands out is that the killer who happens to wear an evil looking Easter bunny mask really likes ruining his victims eyes. Also look out for name drops throughout the movie as this really points out who was the inspiration behind this film. Stand out performances go to Jeremy Todd Morehead as Jeremiah and to Jason Delgado who has 3 parts to play in the movie.